The church at 13th and Fairmont was designed by Appleton P. Clark, Jr.
I’ve long appreciated the architectural beauty of the church building located on the northeast corner of 13th and Fairmont streets, NW, in the heart of Columbia Heights. I personally think it is one of the more beautiful churches in the area. 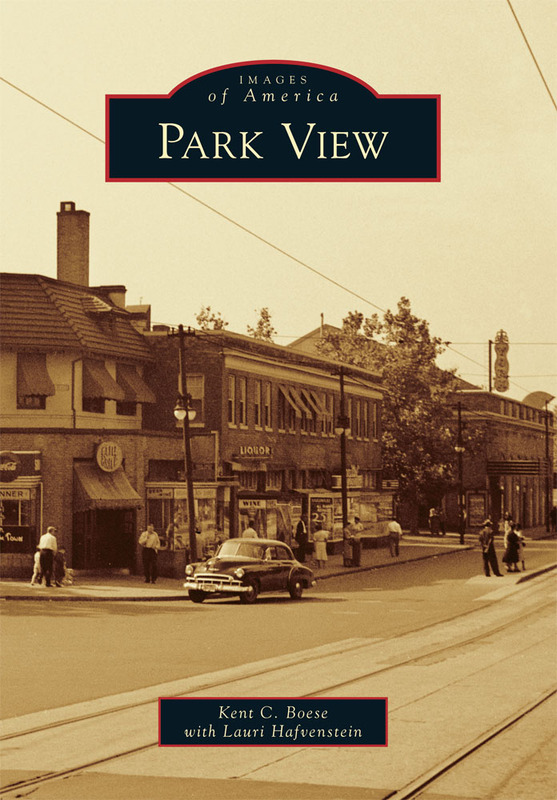 Significantly, the church has been home to only two congregations.Today, The Greater First Baptist Church, Mount Pleasant Plains, calls this building home and has since it acquired the building in 1956. Before that, it was the home of Fourth Presbyterian Church which built the original building and began worshiping there in 1899. Both congregations are deeply rooted in Washington with interesting histories in their own right. Fourth Presbyterian was founded in 1828 and Greater First Baptist was founded in 1878. In the future, I hope to write more in depth about both congregations’ histories, but for now I’m going to focus on the architectural history. While the church appears to be one building constructed at one time, that actually isn’t what happened. The structure as completed was designed in 1927 by well-known Washington architect, Appleton P. Clark, Jr. The building appears to be designed in the Italian Renaissance Revival style. 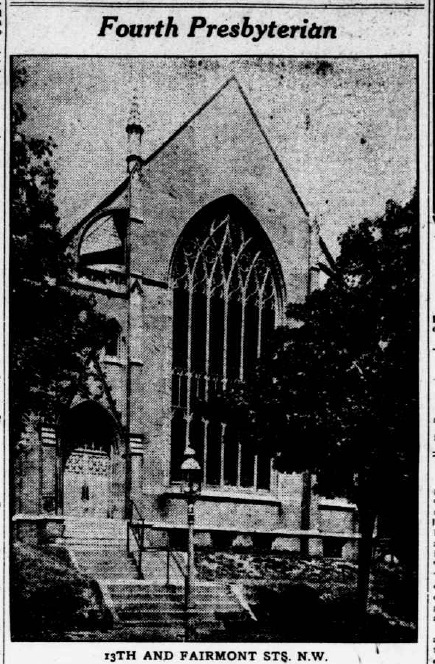 The cornerstone was laid on October 21, 1927, and plans were made to celebrate the dedication of the new structure on the 100th anniversary of Fourth Presbyterian’s founding. The beautiful building completed and dedicated in 1928 was the end result of a process begun around 1889 and with a much different design. 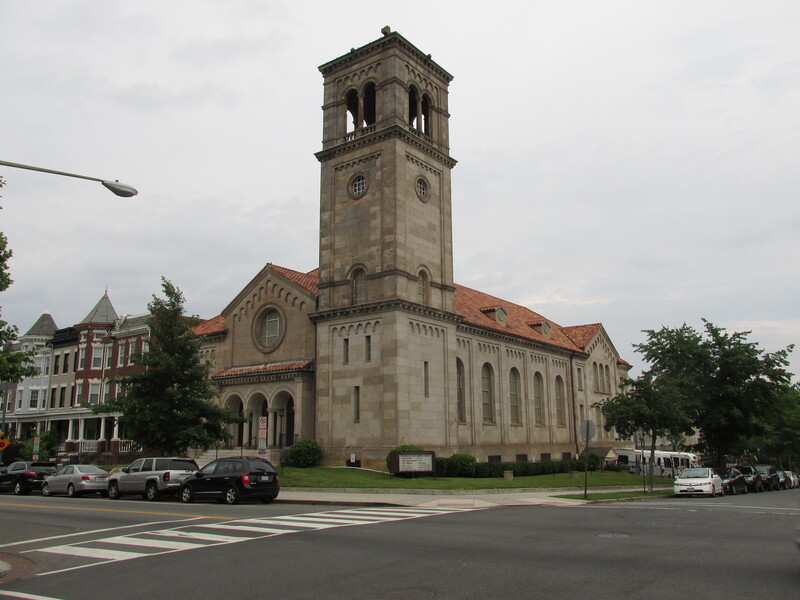 The Fourth Presbyterian congregation decided to move from their original location at 9th and Grant Place, NW, and relocate to Columbia Heights in 1898, after nine years of contemplating a move from downtown. 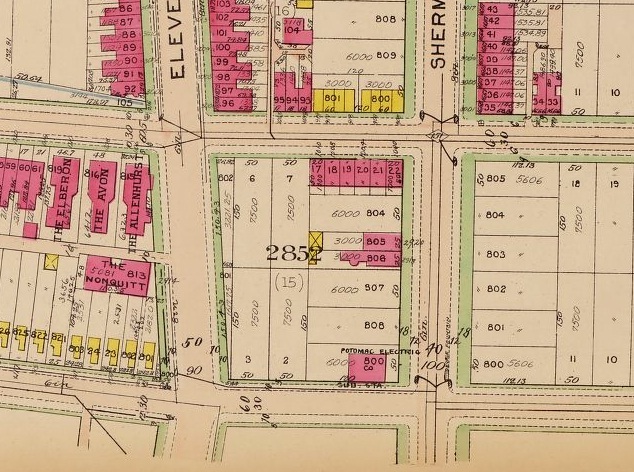 They chose and empty lot at 13th and Yale (Fairmont) Street and hired noted Washington architect Frederic B. Pyle. Pyle’s overall plan for the church building would remain mostly true over time. 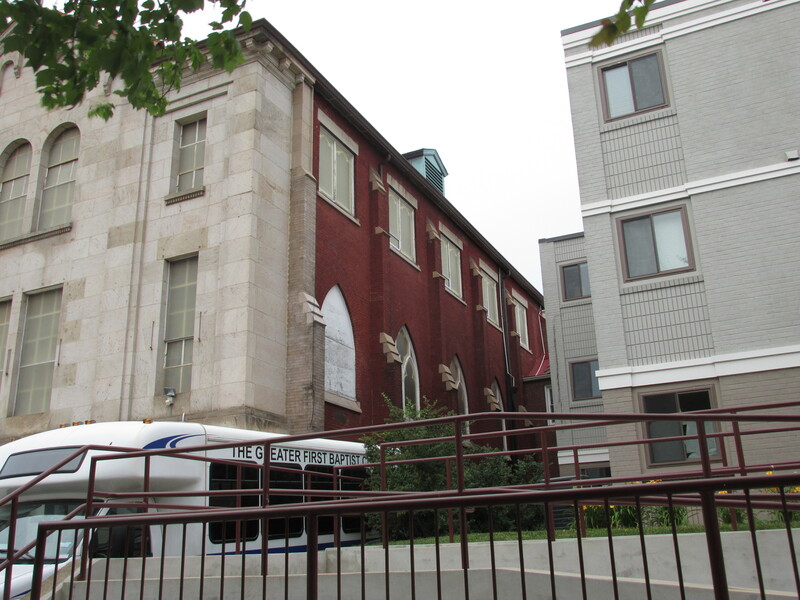 It contained a large Sunday school and chapel structure at the rear of the property (with the entrance along Fairmont Street) and the sanctuary toward the front with the entrance at the corner of 13th and Fairmont streets. Pyle chose to design the building in the Gothic Revival style, however this aesthetic would never be realized beyond the chapel structure. When construction ended in 1899, only the rear portion of the church designed by Pyle was completed. This was the chapel and Sunday school section of the church and it would be the primary church space until the larger and remodeled church structure was completed in 1928. It is interesting to note that while the primary sanctuary remained unfinished until 1928, a smaller addition was added to the chapel in 1903. This addition was a gymnasium building auxiliary to the church and first opened on May 20, 1903. 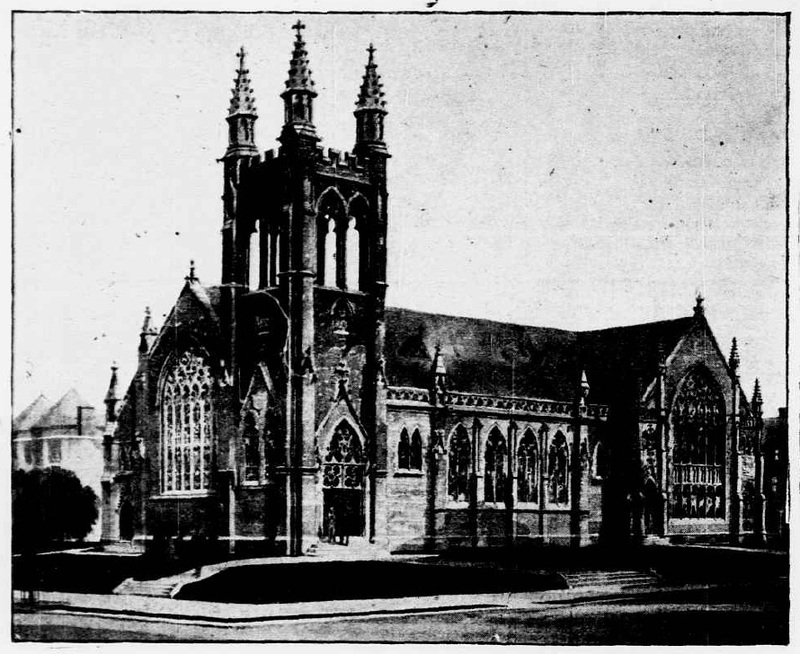 At the time of construction, Fourth Presbyterian was one of two churches in Washington with an established gymnasium. The other church with a gymnasium was the Whitney Avenue Christian Church. In addition to the provision for gymnastic exercise in the building, it also contained a reading room and was used for entertainment. Though not obvious to most people looking at the building today, traces of the original Gothic chapel and the gymnasium addition are both visible to anyone knowing where to look. The east elevation of the chapel was not modified during the 1927 reconstruction and still shows its original red brickwork and Gothic windows. It is a little harder to see the gymnasium building. That requires a walk through the alley to the rear of the building, where the gymnasium addition is clearly visible. PEPCO Substation 13, built between 1907 and 1944. View from the southeast. The small industrial-looking building on the northwest corner of Harvard Street and Sherman Avenue probably doesn’t draw much notice from many that pass by it every day, but the more I learn about the building the more I’m drawn to it. 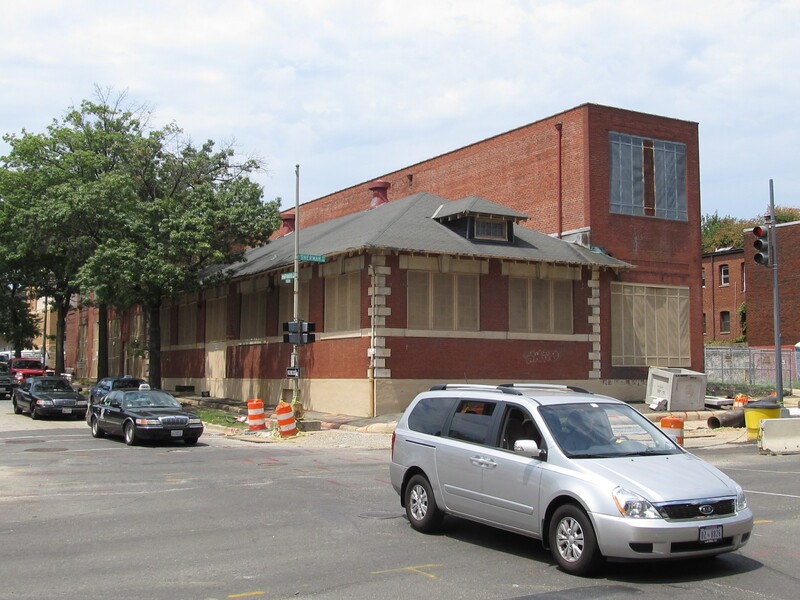 For those not familiar with the building, it’s a Pepco electric substation and dates to 1907. To better understand the importance of this small, unassuming substation, it is helpful to know that Washington was slow to adopt the electric light. Though the city saw its first demonstration of electric lights in 1872, city commissioners did not contract for the installation of even a few arc lamps until 1882. Replacement of gas lamps was further slowed when city officials ruled that all wires must be laid underground. It was not until the 1890s, when rapidly expanding electric street railways demanded a source of power, that the electric industry in Washington experienced its first real growth. By 1901, Pepco, along with ten of the smaller independent car lines and two electric power companies, had been consolidated into the Washington Railway and Electric Company. In its first years under the Washington Railway and Electric Company, Pepco was a captive of the traction interests. It supplied electricity to railroads, and its service generally stopped where the streetcar ended. In 1906 the company began construction of the first unit of the Benning Station along the Anacosta River. Against this background, the substation at 1001 Harvard Street takes on an importance otherwise hidden. It’s early date of construction puts it at the forefront of providing electricity to residential sections of the city. The Washington Times clearly stated in their July 28, 1907, announcement of the coming substation’s construction that it was due to the rapidly growing section that has followed the cutting through of Eleventh street. 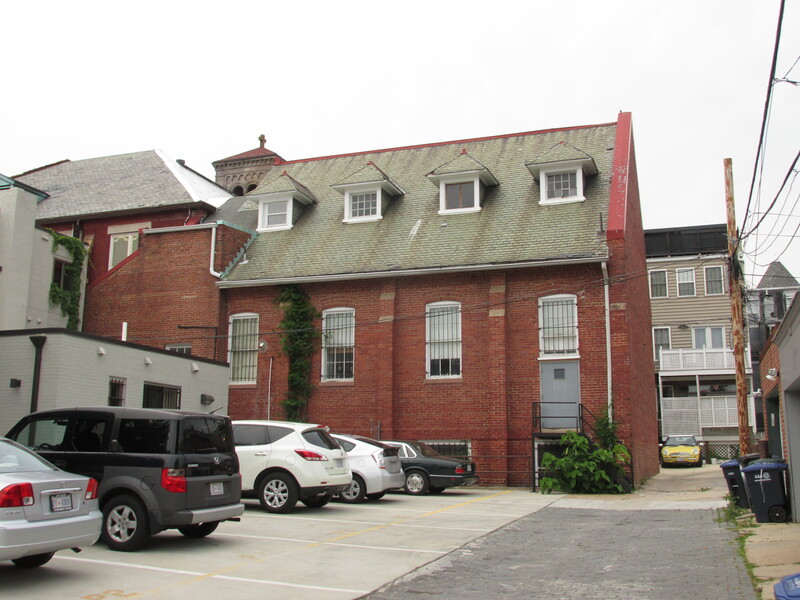 About 50 residents of the area, headed by Henry C. Stewart, 617 Fourteenth street, immediately opposed construction of the election substation citing it as a nuisance and claiming it would negatively impact property values. Despite this, a permit was granted for construction on August 1, 1907. A legal back and forth ensued with Pepco at first being barred from moving ahead before finally being granted permission in September 1907 by Justice Wright in the District Supreme Court. The substation was built in five stages. The original 1907 building was designed by architect Frederick B. Pyle. This was followed by additions designed by Arthur B. Heaton in 1920 and 1921. Further additions were added in 1929 and finally in 1944. Have You Ever Wondered Who Built Your House? Heres some end of the week fun to help us roll into a long weekend. Have you ever wondered who built your house or how old it is? The map below, based on building permits, will help you find out. Once you are at the larger map, you can zoom in and click on the color blocks for details. And here’s one final thought for readers to think about. 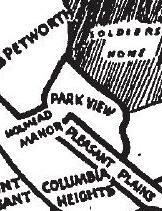 Should I include blocks south of Park Road (between Sherman and Georgia Avenue) on this map, and if so, how far south should I go?